Buffet trolleys and toolboxes for organized storage and transport to the event site. A system of buffet risers and stands to help you create your modular buffet. 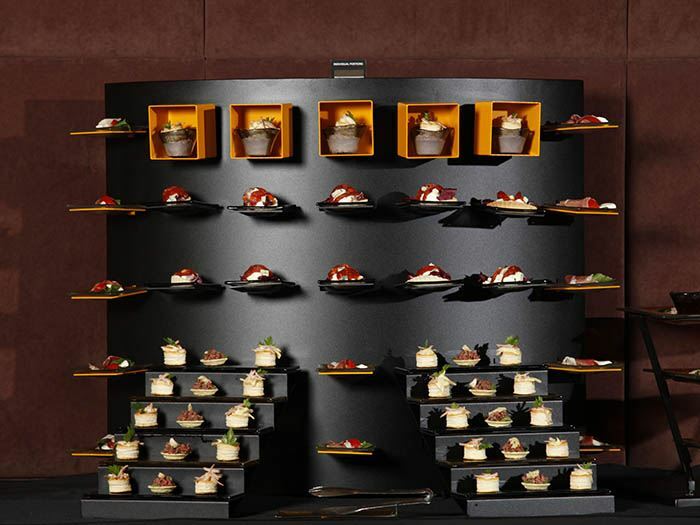 Canape display accessories to achieve the perfect food display. Serveware and other additional items for endless possibilities in food presentation. 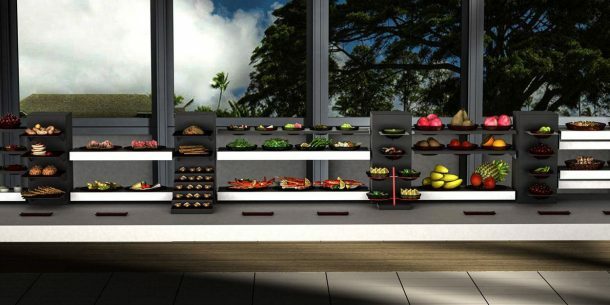 You have a specific requirement for your buffet system? 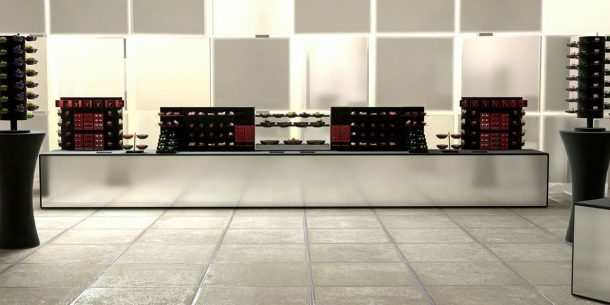 Send us your buffet counter dimensions, and we will create for you, free custom design. Let`s get started! Create a great ice display and keep your food cool and chilled! No need to worry about keeping cold food at the right temperature. It is so easy with the icebox accessory! Fill it with ice and let it do all the work. When you are done, open the drainage to release the water! Alternatively you can keep your food chilled with iThermo which has a -10o degrees Celsius (14o Fahrenheit) freezing point. It has a more efficient temperature transfer compared to blue gel freezes or ice packs and will sustain temperature continualy for 6 hours. To get fully charged, it has to remain in the freezer for 24 hours. Serving warm food? You are covered! Keep your food warm and tasty by combining the inox ice tub together with the inox chafing fuel support. It is easily adjustable to the icebox and can keep a constant temperature of 70o degrees Celsius (110o Fahrenheit). A solution that is way less expensive than the traditional chafing dish buffet set. Alternatively, you can use iThermo cordless and rechargeable food warmer, that reaches 110o celsius (230o Fahrenheit) in under 6 minutes and can operate continually for 3 hours. This battery operated food warmer is fully charged within 8 hours and unlike induction warmers, it creates an even heating surface. 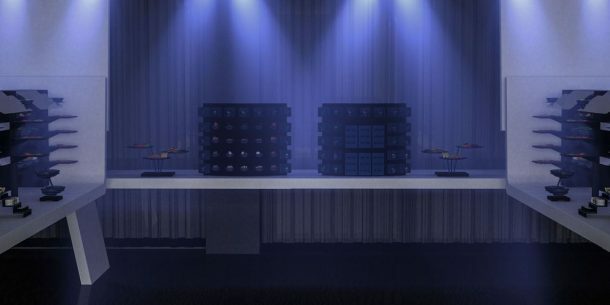 Light up your buffet and illuminate your food display! We offer you a set of unique components that work with the best-seller rechargeable and battery operated Osram Dot-it LED lamp. LED buffet lighting will add coolness and create buzz at your cocktail parties and fashion events, so consider it as a must-have accessory. 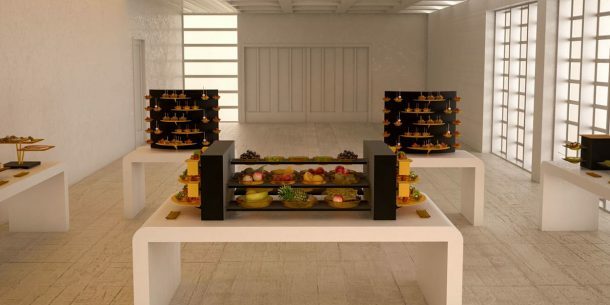 Illuminate your buffet without any cables right at the pool or even in the middle of the room illuminating your canapé displays in unique ways. Sneeze guards are a must in most country regulations. Clickman offers you an acrylic transparent sneeze guard (3mm thick) that slides on top of two buffet risers effortlessly. You just have to let it sit into position, with the acrylic sneezer protection facing you. Easy as that! Protect your food with the acrylic transparent sneezer. 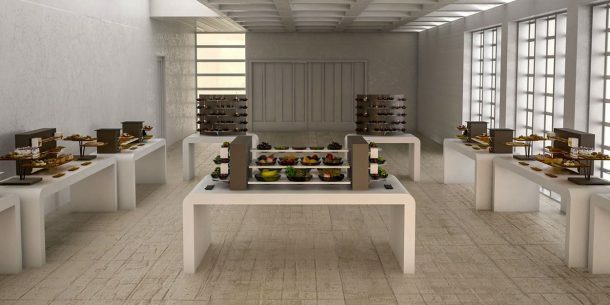 All items of the buffet system, are designed to be folded and stored flat. This design allows stackability, easy transportation and storage. Buffet riser stands come with non-woven bags, while smaller canape display accessories with plastic carrier bags for protection and storage. All metal components are powder coated sheet metal that is extremely resistant to scratching. You can store a 15 meters buffet counter system into a trolley with size of the euro pallet (80x120cm). No need for extra shelves in your warehouse. Mobile buffet systems are great solution for outside catering. In your warehouse, you can store a 15 meters buffet counter inside a trolley occupying warehouse space of 90 x 120 cm. You will not need extra shelving. Move the trolley inside the truck and drive your buffet system at the event site. Buffet systems are the finest way to present and offer food to your customers in an alluring and elegant way, no matter the type or size of your venue. Putting great thought on the characteristics and features of the buffet systems most suitable to your needs is very important, and should not be considered an easy task. 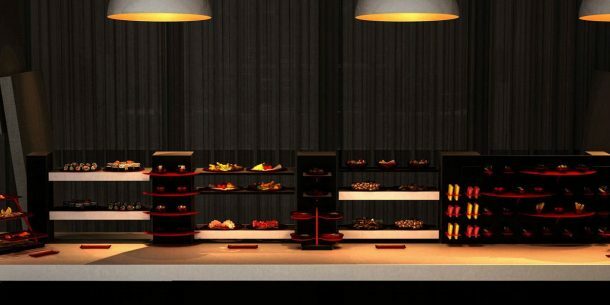 Beautiful yet practical buffet systems will put your creations under the spotlight while at the same time they will help you serve your customers in an effortless way. 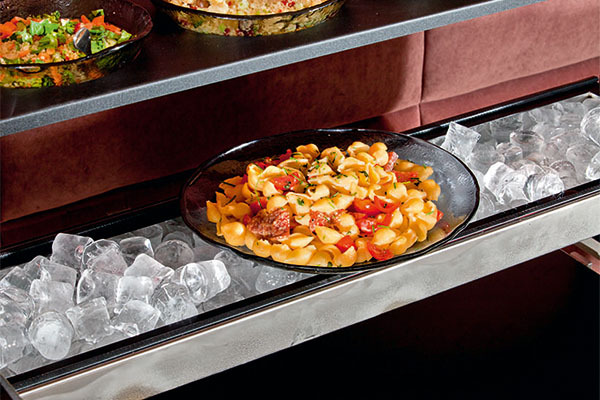 Clickman, a buffet system by The Glass Co, is the ideal “tool” that will make your buffet a memorable one, whether it is a breakfast buffet, a coffee break buffet or a brunch buffet. 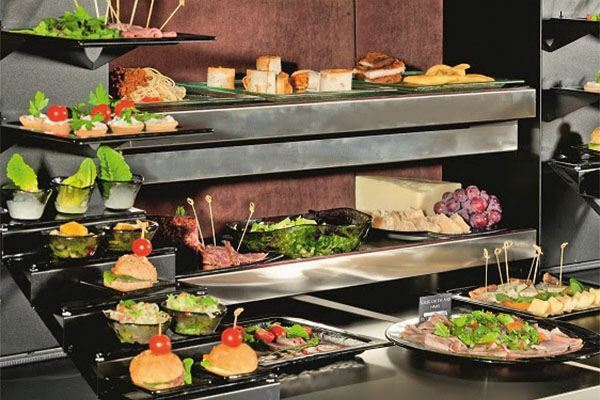 We are particularly proud of the fact that Clickman is a buffet system suitable for all types of buffets, and this is a feature we gave much thought to, taking into account our customers’ specific needs as well as modern trends in the hospitality business. To begin with, our buffet systems are great when used as a coffee break buffet, breakfast buffet or brunch buffet, and here are the reasons why: the most important characteristics of Clickman is that it is a modular and mobile buffet. And what does this mean? To put it simply, it means that it can be whatever you want it to be. Depending on your needs, i.e. the number of people you wish to serve, the size of your venue or the type of event (for instance a lounge buffet, cocktail buffet or receptions buffet) Clickman can be assembled in a different way and be used with different serveware to subtly accentuate the important details of your buffet or simply present your food in a both appealing and useful manner. Especially appropriate as a banqueting buffet, our mobile and modular buffet system will not only rise to the occasion each and every time, but will also be the most skillfully prominent detail of the night – or day (as said before, it is an excellent choice both as a cocktail buffet or a breakfast buffet). Another feature that makes Clickman a necessity is that it can be combined with our plethora of serveware and buffet risers, from mini bowls to multiple tiers, making it appropriate for all types of events. Feedback has shown that Clickman has been extensively used as a coffee break buffet, not only at hotel lounges, but also at meetings and other locations where catering was employed. Our buffet system has also been extensively used as a brunch buffet, mainly due to its mobile and modular nature that allow it to take many forms, serving a wide number of customers at once while at the same time enhancing the visual appeal of the food. When using Clickman as a brunch buffet you can make use of its various spots for plates, which are suitable both for hot and cold dishes, condiments, drinks and much more. On the other hand, when using bowls instead of plates, Clickman becomes the ultimate tool for a breakfast buffet, perfect for cereal, bread and all kinds of marmalades or honey. Of course, our buffet systems are ideal when used as coffee break buffets, too. Providing ample space for coffee or tea cups, as well as for all types of snacks such as sandwiches, is the kind of detail that has made Clickman so widely known in the hospitality business. Its tiered cake stands are a widely used aspect of our buffet systems, which of course find their place in more than one occasion. 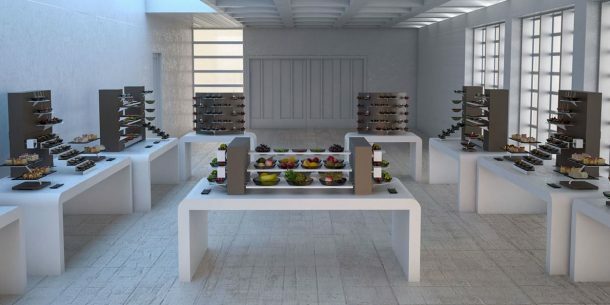 The fact that Clickman is both mobile and modular, meaning that it can be set up and disassembled in no time, but, most importantly, that it can be elegantly combined with all our serveware (size and color) is what has endorsed it to be employed by the top hoteliers, restaurateurs and caterers all over the world. The different results you get when setting up our buffet systems have also made Clickman the optimal choice for a cocktail buffet or a lounge buffet. Our buffet systems have also been designed while keeping in mind that they could be an excellent alternative to receptions buffets. For instance, you could match the colors of the tiers to the interior of your venue, but every now and then you could change the position or size of the plates according, for example, to the season or the event that is taking place. 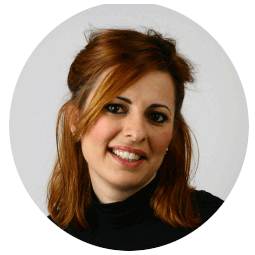 This way, you can get the most out of Clickman, even if you do not make use of the fact that it is mobile, only of the fact that it is modular. Many of our customers, especially in the catering business, use Clickman as a banqueting buffet as well, and the feedback we receive is extraordinarily positive. 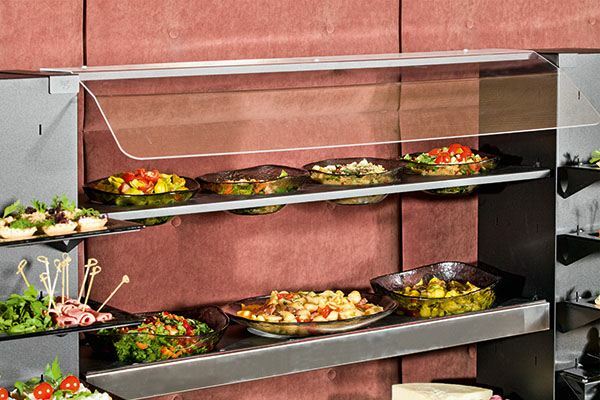 The Glass Co buffet systems are ideal for everyone in the hospitality business. Our top-notch quality dinnerware may be what made us known and recognizable in the first place, but the passion with which we create has passed on to our designing of buffet systems as well. We may have begun by designing coffee break buffets, breakfast buffets and brunch buffets, but what experience has taught us is that there are no limits. As long as our customers, and we, ourselves, use our imagination and put our skills to good use, our designs and uses of Clickman are limitless. For example, now that cocktails are more in fashion than ever, Clickman has been seen as a cocktail buffet quite often, which proves that our buffet systems follow trends and can be also adapted to your needs in the blink of an eye. 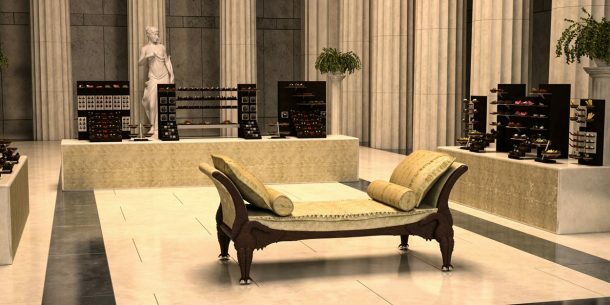 There is no greater accomplishment than seeing Clickman being used as a lounge buffet, receptions buffet or banqueting buffet, even if we designed it with a completely different setting in mind. If you want your hotel, restaurant or catering business to reach the zenith, your services or culinary accomplishments alone will not do the trick. 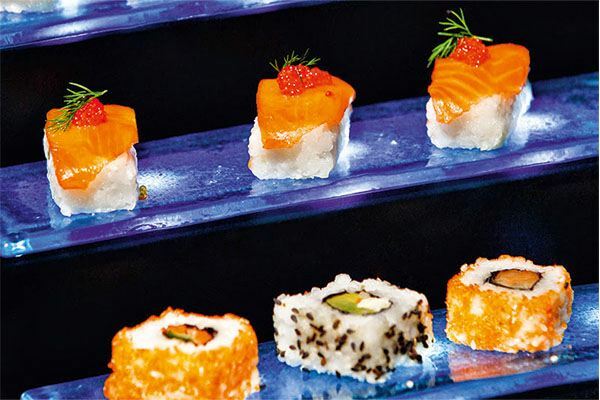 Presenting and serving in the best buffet systems available is what will set you above your competition. From a coffee break buffet to a cocktail buffet and from a breakfast buffet to a lounge buffet, and of course for everything that comes in between, for instance a brunch buffet or a receptions buffet, The Glass Co, and Clickman in particular, can make your dishes stand out and surpass your expectations. Don’t pass on the opportunity to create a buffet the way you imagined it, whether you are in need of a breakfast buffet or brunch buffet, or any other type of buffet actually. Seeing our buffet systems the way you imagined them and not the way we designed them is the greatest compliment to our work. Thank you!